Its hard to believe we are less than a month away from when California State Bill 1520, the ban on foie gras, takes effect. 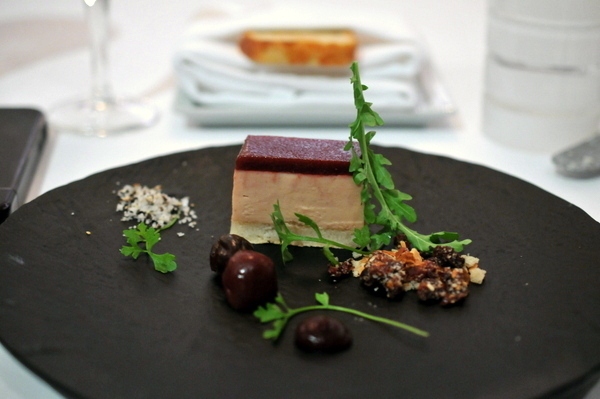 A number of restaurants have done all-foie menus ahead of the ban, but these have mostly been one or two night affairs Melisse is the first to offer a regular all foie menu. 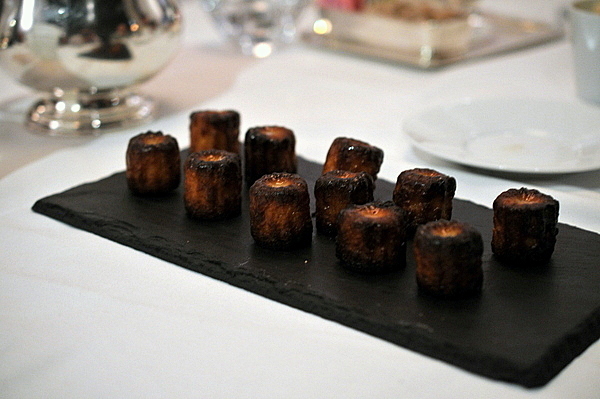 Citrin's signature canape was the only thing we received this evening that didn't come with foie. Here we have two preparations a classic one with a hemisphere of grape and a modern one with a sphere of grape jelly. The sweet tang of the fruit and piquant game of the cheese whet the appetite for the meal to come. For our first course, Citrin took a page from his friend Ludo's playbook. 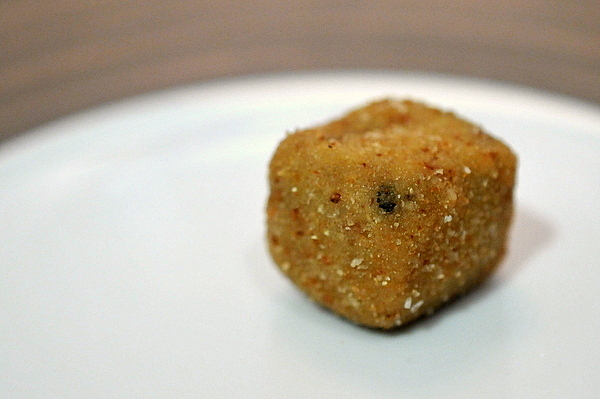 The delicate bite-sized croquettes are filled with a liquid foie gras center which squirts out with a mouth-filling savor upon mastication. 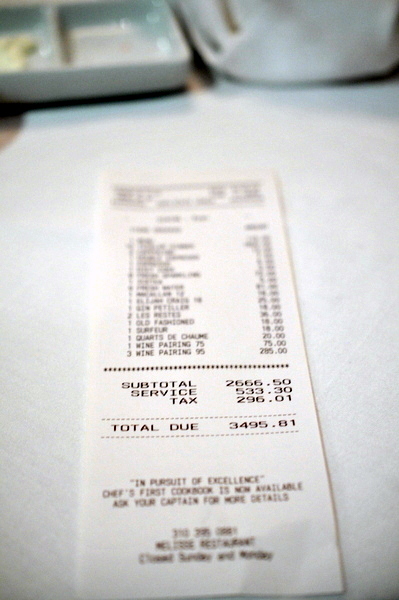 This was my second time having Foie Gras Royale in as many weeks. 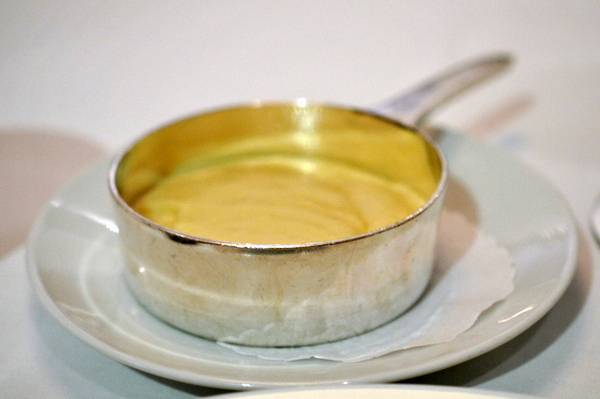 Subbing for the fantastic Fennel Flan, the core of the dish is a subdued foie gras custard, made with eggs and cream. The base of blackberry gelée is similarly muted and quite fitting to the delicate Royale and on top we have a slightly tart buttermilk mousse. Though the overall flavor is quite restrained, the mix of textures makes for a singularly luxurious mouthfeel. 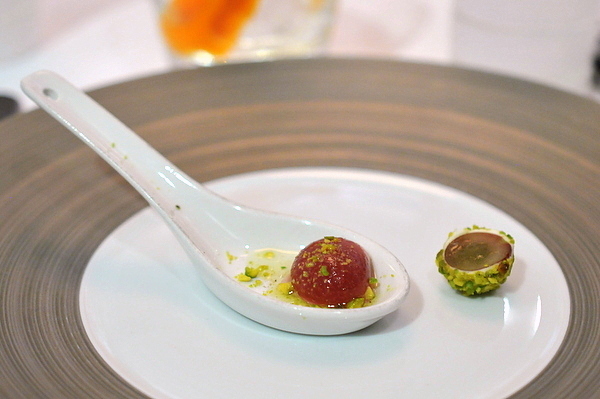 This was probably the most traditional course of the night pairing velvety foie terrine with sour fruits and toast. While I may have developed a preference for more contemporary preparations its hard to fault such a well done terrine. The texture is uniformly smooth and luscious while the buttery sweetness is deftly tempered by the light tang of the sour cherries. 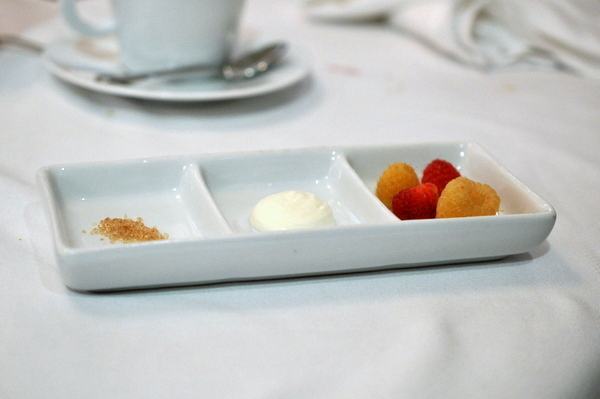 The crisp toast provided a nice textural contrast as well as a lingering essence from the whey. This was one of the courses I was most looking forward to and it didn't disappoint. 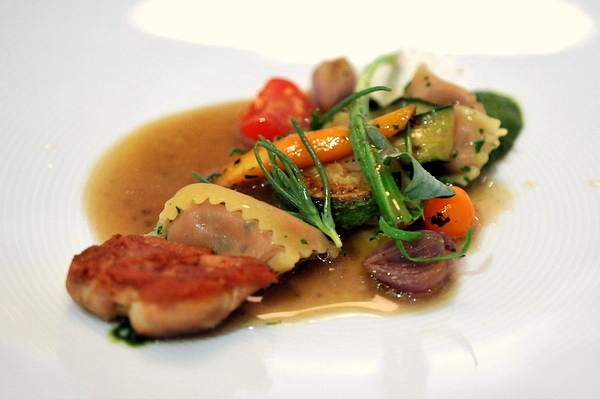 The tiny raviolis are filled with a rich and creamy mixture of Mascarpone and foie gras. The melange of summer vegetables added color, texture, and levity while the pistachio consomme provided a contrasting bitterness. My feelings about the crisp chicken oysters were a bit more mixed; though the typically toothsome and flavorful, the crispy top was a bit dry. 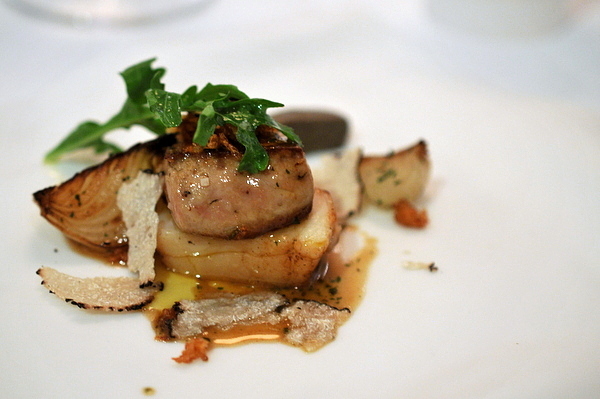 True Day Boat Scallop "Rossini"
Named for a 19th century composer who liked to order his food this way, Rossini preparations always pair up black truffles with foie gras. Black truffle was made to be paired with scallops but I was worried the liver would overpower the delicate flavor of the shellfish. Surprisingly the scallop remained the star of the dish, a lovely slick core surrounded by a perfectly caramelized sear. The Cipollini adds a juicy spicy-sweet bite that keeps the oily seared foie in check. 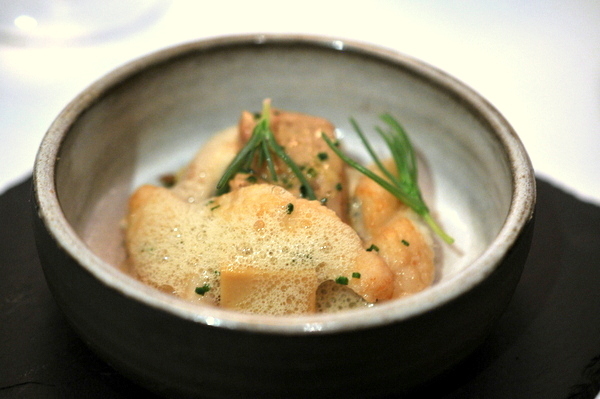 Like the scallop, I was a bit dubious about pairing foie gras with fish, but again there was no need for concern. The sole is imbued with the richness of brown butter, the poached foie seems The troika of corn, Chanterelles, and brown butter is absolutely winning; a novel mix of sweet and savory with a whisper of earth thrown in for good measure. The final savory was a whole duck course, the succulent breast and savory confit of duck are topped with shaved and whipped foie. The silken duck liver melts on the tongue augmenting the already lovely sapor of the bird. Though I'm not normally a fan of overly sweet elements in my savory dishes, the sugariness of the cooked peaches cuts through the fat before it becomes overwhelming. A small dish of buttery mashed potatoes helps quash any lingering hunger. Our dessert actually featured two types of foie, ice cream and a mousse sandwiched between two delicate pieces of cake. The foie is mixed with enough cream to strip away any hints of offal leaving behind only a sense of butteriness. 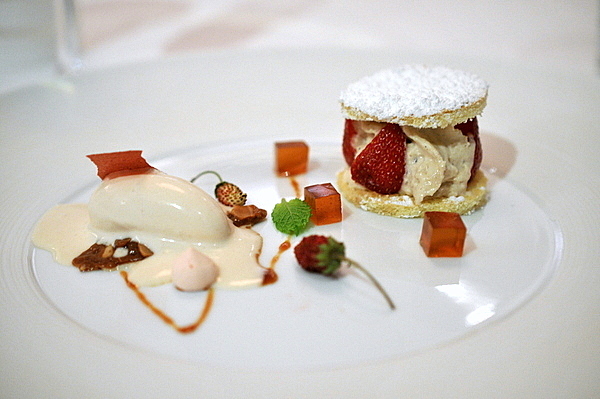 The strawberries and balsamic gelée provide a tart counterpoint that gives the dish contrast. 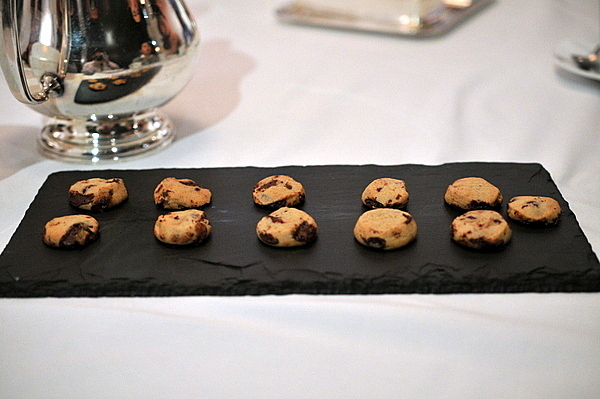 The treats ranged from the prosaic (chocolate chip cookies) to the profound (foie gras macarons) with canales and fresh berries thrown in for good measure. 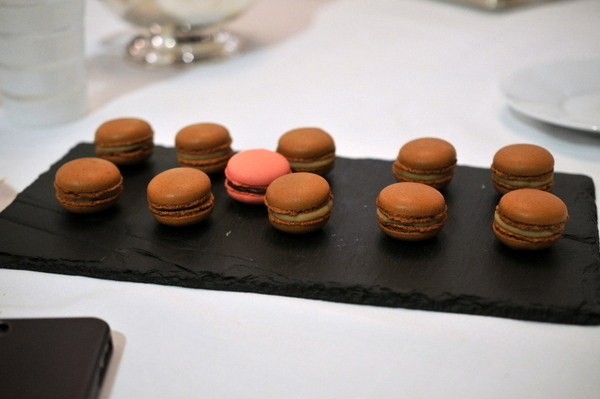 Naturally, the macarons were the most interesting with a provocative berry sweetness and a dense chewiness not typically associated with macarons. 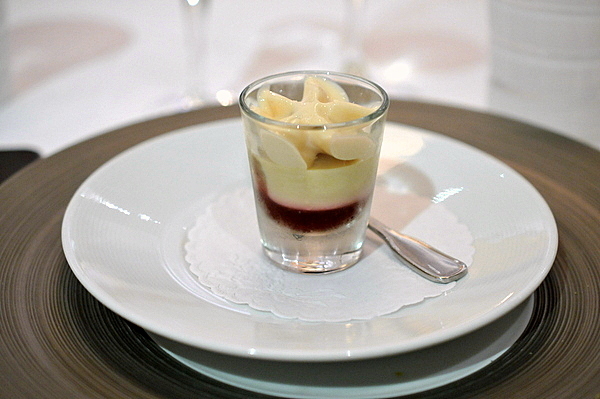 I spoke briefly with Citrin about the meal during the 5x5 at Melisse and he assured me that it wouldn't be too heavy. 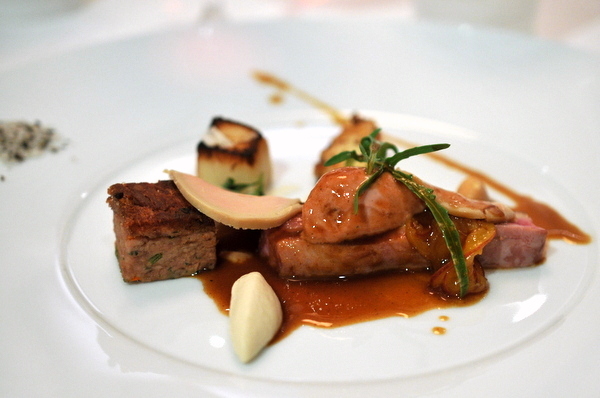 The food certainly lived up to his promise, celebrating the essence of foie with a finesse and verve. Of all the foie gras menus that I have had this is easily the most cohesive and well thought out. With a little over two weeks left, I recommend making a trip before its too late. I'll be here on the 30th for my last foie meal! Good choice. I'll be at The Royce on the 30th so I had to get this out of the way before then. I'm with you on liking the way he kept the tasting and dishes balanced rather than try and kill you with foie (though not a bad way to go out). Also a great place to support as Citrin was one of the guys who was actually protested - I've been annoyed by the number of restaurateurs who were silent while others were harassed and are now trying to cash in last minute.